Throughout my twin pregnancy I was very hopeful that I would be able to have a vaginal delivery like I had with my two previous children. My OB said she would give me the green light as long as baby A was head down. Because I had a “proven pelvis” it didn’t matter what position baby B was. Going to my ultrasounds week after week both girls were doing a lot of gymnastics. In fact almost every one of my ultrasound technicians commented on how unusually active they were especially when they each moved from head down to up to down again all during one ultrasound. In the end Baby A decided to plug the exit with her bum and their fate was sealed… a c-section it was. 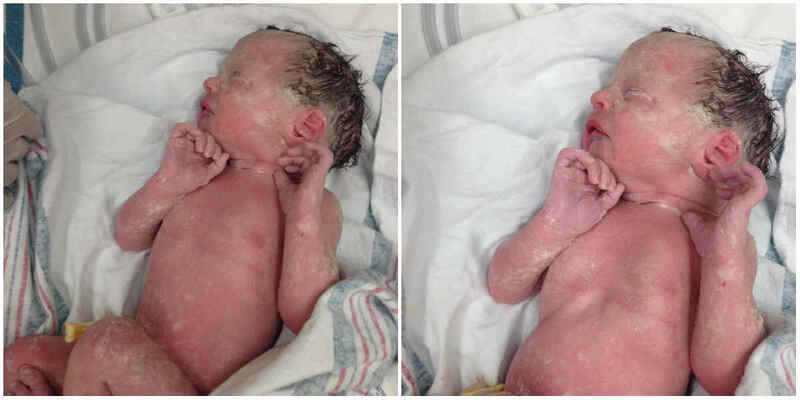 Although I always knew that I had a much higher chance of having a c-section with twins, to actually wrap my head around it was a different story. I had seen many shows on TV where they show a birth via c-section but to keep it entertaining they always skipped the mundane and icky details building up to the doctor holding this pink baby in the air like Simba from The Lion King announcing their arrival. That’s when a million questions about logistics, timing and surroundings started swirling around in my head. I went to two of my best friends who had had c-sections and asked them to walk me through every tiny detail even having them back up when I felt they missed a part. 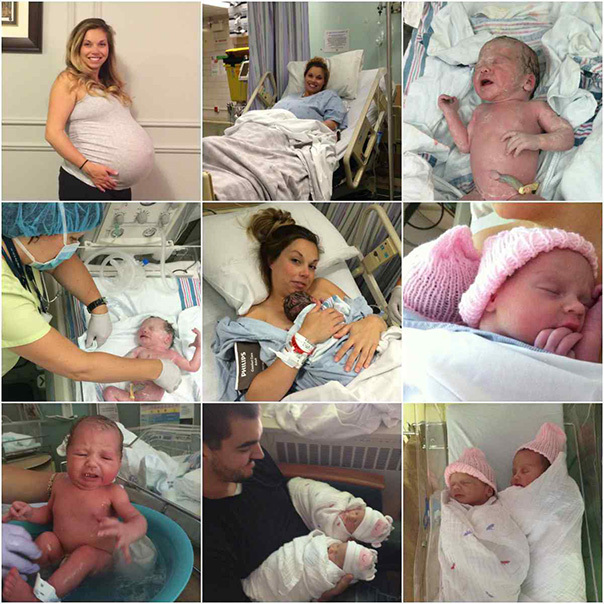 Knowing all of these intricate details helped me immensely but to actually deliver two babies instead of one like each of my friends had put a slightly more dramatic twist on the big event. At this point I was to temporarily say goodbye to Mike and walk into the operating room pushing my IV along the way. I have had surgery before and my friends described the operating room to me but I really was not quite prepared for what I walked into. Massive bright lights, tools layed out covered with small sheets and the biggest thing that took my breath away… an entire area designated for the babies including two warming beds. Anyone who has ever given birth before can probably relate to that moment when you see the warming bed ready and waiting for your little one while they are still in your belly. It’s surreal! To see two warming beds with additional equipment on standby, unlike when I had delivered my older two, shot a rush of adrenaline and put me into this speechless-shocked state. You know the kind; where you are literally having to remind yourself to breath in and out? The nurses helped my big belly and I up onto the table and into a sitting position to receive my spinal epidural. As they curved my spine over and held my shoulders down the nurse in front of me began asking me completely irrelevant questions obviously trying to distract me from the intense situation. I could barely string together a sentence as my body started shivering. While all of this preparation was going on, Mike was given his own daddy operating room garb to wear and waiting on pins and needles. Excitedly he waited for ten minutes before he was ushered into the room by a nurse. 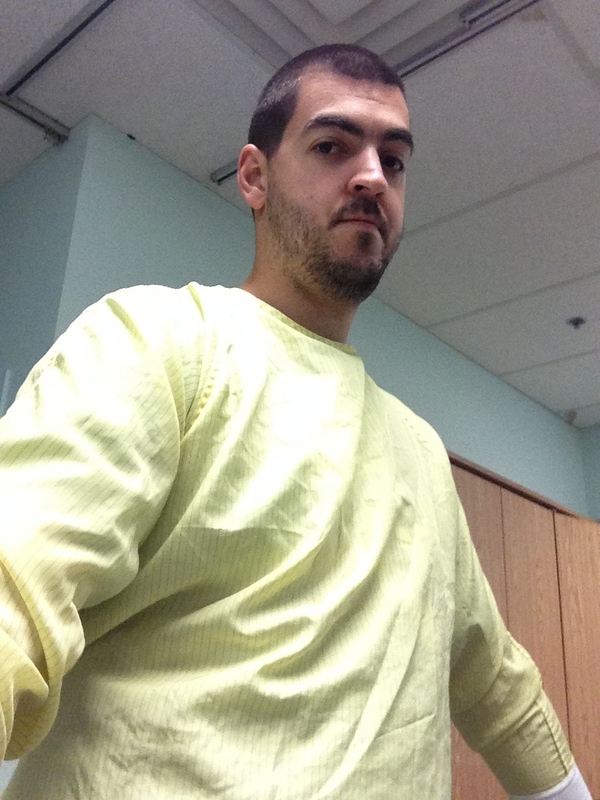 Mike sporting his very fashionable operating room garb and looking super pleased about it! When my epidural was in place they had me lay down on the table and buckled me in across the thighs, calves, chest and arms (so they could tilt the table). Then they pinned a sheet up right near my face so I couldn’t see what was about to unfold. I settled in with my head turned to my right to face where those two empty warming beds sat so ominously while the anesthesiologist sat to my left. Although I was quite numb at this point I could still feel a little bit which they had told me is normal. I could feel them rubbing the iodine all over my belly and then I could feel what felt like tiny pokes. I spoke up letting my OB know that if that was them testing if I was numb enough to start then no, I could still feel a tiny bit. My OB filled me in that they were already under way, the incision had been made and they were starting to make their way to baby A!!! This was the point that Mike was ushered in through the back door behind my head to avoid the gore and because he wasn’t sterile. He was instructed to sit on a stool to the right of my head, near the warming beds. My OB was making small talk and again trying to distract me by asking random questions and after attempting to make small talk back I gave up and zoned out. I vaguely remember her mentioning that I wasn’t listening anymore and she then switched her attention to Mike and they continued the chit chat. Suddenly I found myself in agonizing pain in my right shoulder, which couldn’t move because my arms were restrained. A slight bit of panic began to set in and this was the first time I took my concentration off of those warming beds. I told the anesthesiologist and he reassured me that “gas pockets” are normal which was the cause of my shoulder pain. He immediately injected a analgesic (pain killer) into my IV. That’s when I couldn’t breathe! It was like whatever he gave me froze my lungs for a moment. Apparently that is also normal. That passed quickly and by that point the OB was telling us that baby A was about to make her exit. At 8:08AM she held up this adorable screaming squishy little baby we proudly named Mia. Mia was passed off to a nurse and unlike my previous deliveries, we were still waiting for another baby! Mike tried to stand up to catch some of the action and the anesthesiologist firmly put a hand on his shoulder and told him to sit down because if he fainted they would just leave him. He was the fourth most important person in the room after all! He quickly complied. I could feel pushing, pulling and tilting and without making that second incision the OB reached her entire arm up into my abdomen, right up to her shoulder and scooped baby B out of my ribs. At 8:09AM a squished and screaming sweet little baby was held up and we named her Everly. As the OB began to close me up I could see some commotion coming from the warming beds and noticed that all of the nurses had left Mia and were gathering around Everly. I immediately knew something was wrong. I could hear Mike asking questions and the nurses calmly telling him that she was in-drawing which means she was having trouble breathing and that she would need to head to the NICU. They then turned to me to fill me in and I quickly stopped them explaining that I heard everything and without hesitation instructed Mike to follow Everly to the NICU. While Mike was with Everly in the NICU the doctor and nurses finished closing me up, cleaning me up and moved me back to the pre-op room. About closing me up; there had been a debate with my doctors deciding between staples or stitches. I had preferred stitches because I had previously had a bad experience with scaring from staples but my OB reassured me that she thought staples were the best route. In the end I decided to go with what she recommended and I am glad I did. My incision healed really well and it is just a thin line today. While shivering and in a bit of a daze a nurse brought Mia over to me to have skin to skin time. We settled into a wonderful cuddle and she started nursing right away. During this time Mike came back to tell me that Everly was breathing well on her own and was now just being monitored for a little bit before being brought back to me. What a relief! My shivering intensified and it started to become almost impossible to take my blood pressure which ended up delaying my move to the maternity ward by over an hour. 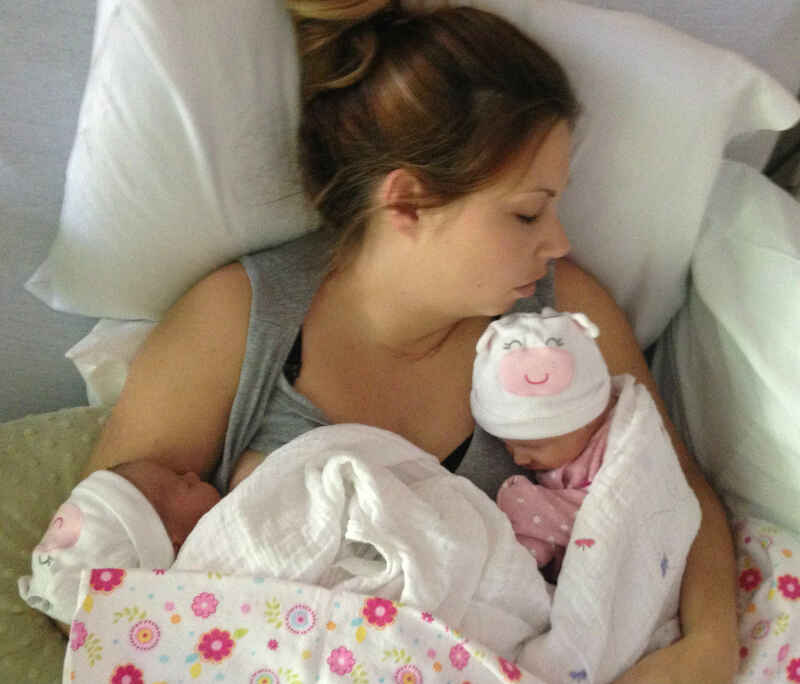 Everly was eventually brought to me and although I was over the moon holding my precious daughters I was still finding it difficult to recover from the shock and shivering. I couldn’t stop starting at their tiny faces studying their perfect but very different features. Although Everly came out very squished looking (which is VERY common with twins) she was quickly rounding out into this adorable little baby! 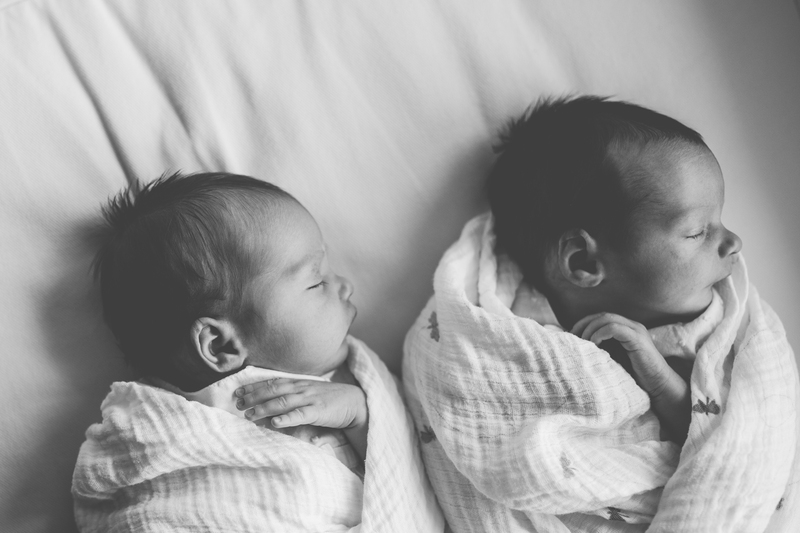 I was eventually wheeled in my hospital bed to the maternity ward holding my two new bundles proudly attempting a smile through shivers as people ohhh’d and awww’d over our twins. Thanks to the most incredible nurse ever I was quickly warmed up by her enveloping me in a pile of warm blankets and because our girls were having a hard time regulating their body temperature we were instructed to have skin to skin time… for the most perfect cozy three hours of my life! As a parade of visitors flowed into the room to meet the two new additions of our family my very protective nurse made sure that my girls stayed put on me much to my delight and the disappointment of their grandparents! During that three hours this incredible bond formed between the three of us as my girls cuddled and hugged themselves into my body. This was it, the result of those agonizing eight and a half months of hard work and determination. The prize could not have been sweeter! It was so important for me to write this blog post with as much detail as possible. 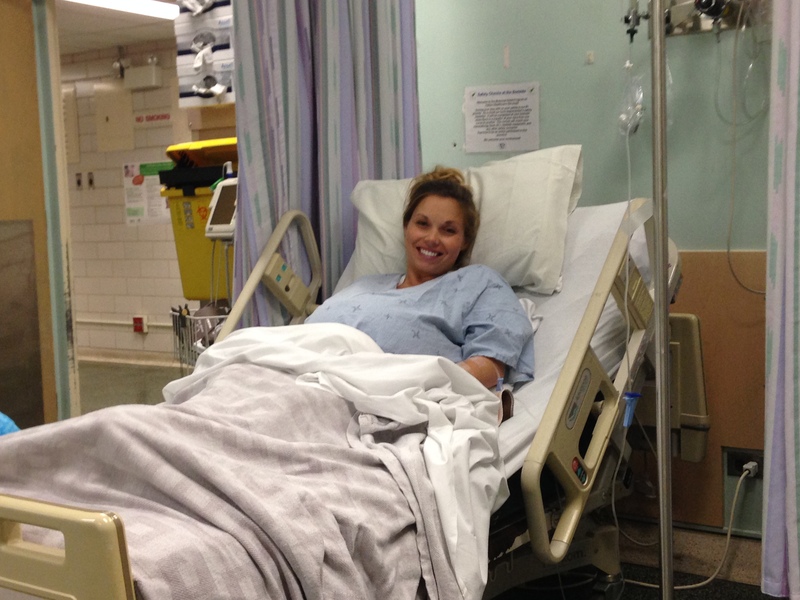 When I knew that I was going to be having a c-section I looked high and low for as much information I could find on what to expect. Although this story is specific to our experience I hope that my journey with our girls can help other mamas to prepare for what’s ahead. Please feel free to ask me any questions you might have in the comments section below and I would love to hear YOUR birth stories! I will be blogging soon about the days following the birth of our twins and all about the recovery of a c-section so please don’t forget to subscribe to Nesting Story and follow on Facebook, Instagram and Twitter so you don’t miss it! What a great story. Such a wonderful experience. Your girls are precious. You should write a book. Love everything you write. So down and earth and realistic. Looking forward to your next blog. Wow… What a lovely experience!!! I am like still 6 weeks pregnant and just got to know that it’s a twin pregnancy… I was thrilled about the news and scared as well… Reading your blog has made me feel better and look forward to the D-Day …. I just found out my husband and I are having twins! I am due in July! 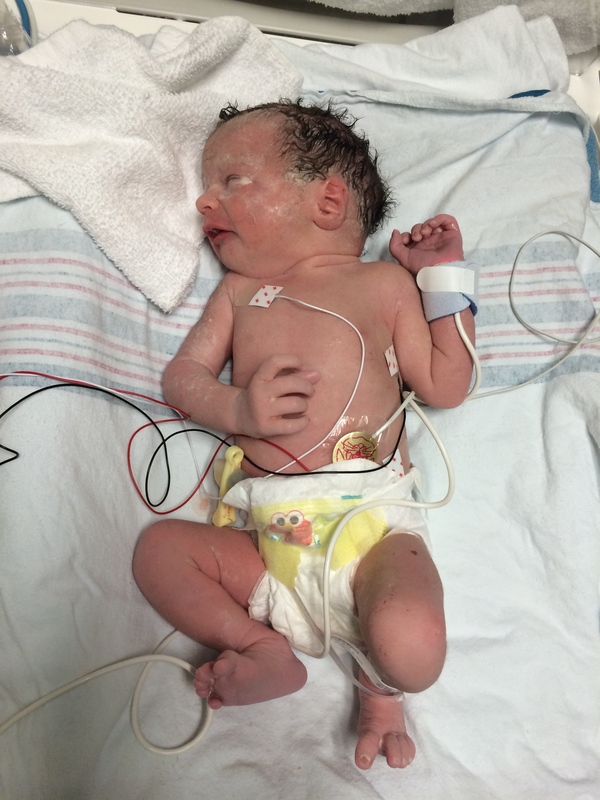 I am really nervous about the idea of having a c-section, but your post was so great! It was amazing to read all the little details, it seems a lot less scary after reading! Thanks for sharing! What a relief!!! God bless you. Did you have any sign of labour before the CS? How long did it take before the placenta came out? Lastly, how long did the whole thing take? Great story! I can still recall my c-section to my twins. They are turning one this month! Congrats on getting through the first month Neri Ann!! Thank you so much for sharing. I am expecting twins this summer. So I am so nervous about what to expect from it. I am also worried my 1 yr old will feel left out cause I will have to give the newborns more attention. Congrats on your beautiful twins and family =0) What a nice birth story, thank you! My son was born via C-Section as I had a 6cm fibroid (sack of blood) blocking my son from moving down my cervix, acting as his little pillow ;0) At 37 weeks 5 days, my Midwife requested that I do another Ultra sound, as from previous weeks before my stubborn fibroid had not moved. I was then referred to an OB and was to see her in a couple of days with the results. When I arrived to the OB, I was informed that my son had stopped growing due to the Fibroid taking all the blood from my placenta. My son was still healthy and doing well but to ensure that there were no complication and to keep him safe, I would have to under go a C-Section. I was really hopping to have my son Vaginally as he had been head down for over two months but things happen for a reason and I just wanted to make sure that he would be safe. Side note: through out my whole pregnancy I had not been emotional until the moment I was told that I would be delivering my son the next day (heck I was still working and would be starting my Mat Leave in just two days)……a whole lot of F-bombs were shooting out of my mouth and I was balling. The OB, god lover her was so supportive and was saying Yep this Calls for an F-Bomb moment =0) So I pulled myself together and called my husband and went back to work to inform my boss and get myself home as soon as possible to get myself mentally ready for my son arrival. I was scheduled to have my son the next day at 3pm. And just like you, wasn’t able to eat or drink after midnight. As soon as I got home I made a big batch of Pasta and Carb loaded until midnight =0) I too was really excited to sleep and got maybe 5 hrs of rest. The one thing that I will not forget leading up to the moment I had my son was how extremely thirsty I was, even as they put the IV’s in, the fluids did nothing for me. (much like you, it took 4 nurses to put the IV’s in). The whole experience of the operating room and being strapped down was the same for me. I was a bit of a high risk as bleeding out (fibroid bursting) was a possiblity and was also told before surgery that a vertical incision depending on my son and the close proximity of the fibroid. As my son was being delivered, I was zoning in and out from all the drugs and laughing gas ( weird feeling of wanting to sleep or just stay happy and smiley) My husband and Midwife were such a great support system the whole delivery and my son was welcomed into the word as a perfect as ever with no vertical incision (thank goodness). What a rush, LOVE AT FIRST SIEGHT. My husband did skin to skin right away as I was being sewn up and was then wheeled into recovery about 20minutes after. Recovery was a bit challenging as I couldn’t get up to feed my son, he just stayed with me at all times in bed. Nursing took a bit but with the help of my midwife, I was able to get the colostrum into him. It was a very surreal experience and will always be thankful that he was delivered healthy with no complication. He is now 16 months and thriving. Sorry for the long Post. I hope all is going well with your recovery, the twins and raising your beautiful family! I loved reading your story Emily! It gave me chills because I can relate so much! I am so glad he (and you) are healthy. Congrats! Sara, isn’t the skin to skin incredible? I had completely prepared myself that I’d barely be able to hold them for the first few hours and that wasn’t the case at all! Congrats! 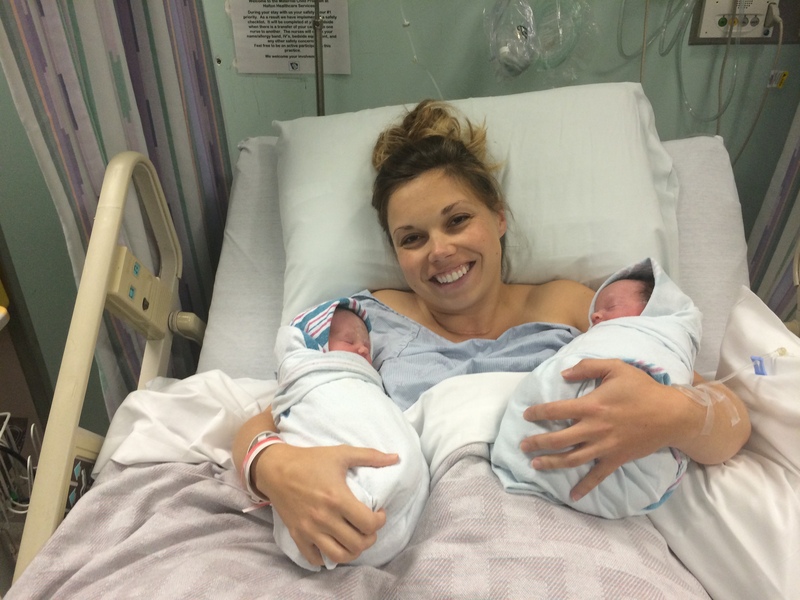 What a beautiful story… I’m in tears reading this as I prepare for my own delivery of my twins. I am so glad you liked it Tania! You can do this mama! Thank you, thank you, thank you for this post! I am 29 weeks with identical twin girls. Before I found out I was having twins, I had a birth plan I was set on. When appointment after appointment went so well I started to feel more in control of how things might turn out. Baby A has been head down since week 16 while baby B flips around constantly. I started to become obsessive over the fact that things were going to happen the way I wanted them to, and without a lot of insight from others I felt justified. It helps me so much to read about your delivery because it really doesn’t feel like there is much out there about twin births. I know that it’s really beyond my control to decide how my babies are born and that their health (and mine) are really what’s most important. It helps to realize that I need to be more flexible and open minded in order to have a positive birth experience, no matter the method of delivery. Was your recovery difficult with two babies to care for? Thanks again, I really found comfort in your post! I am so glad you found my twin’s birth story helpful. My recovery wasn’t too bad. I listened to the doctors about walking around to help heal which did help. I also spoke up and got some stronger pain killers when I needed them. By two weeks you feel pretty great after a c-section. You just have to make sure you don’t over do it! Good luck and keep me updated! I am so happy to hear this! I just found out I will be having twin around August. This is my first pregnancy and I have had lots of people telling me I shouldn’t have a csection.. Although that is what my doctor recommends. I am also glad to hear that recovery was okay.. As that is what many people have tried to scare me with. I almost cried a couple of times. Thanks for sharing this! Thank you for sharing your story! I just found out last Monday that I am having twins and tonight for some reason I started thinking too much about a c section. Lots of fear suddenly. This has helped me tremendously! Thank you for sharing your experience. I’m pregnant with identical twins and I’m really hoping to deliver them vaginally as I did with my son 7 years ago. I’m so scared even though I’m not due until August but your experience puts me at ease. Congratulations on the beautiful baby girls!! I have twin boys due in April, and reading your post really makes me feel more prepared for my eventual c-section. My OB is c-section only when it comes to twins, so even though my boys have been head down for a month now, I won’t have the chance to choose vaginal unless he’s out or I end up at a different hospital for some reason. I have identical twin boys coming in April, too! I’m extremely scared about having a c-section, too, but I’ve been told and agree that a scheduled cesarean is safer than an emergency one, and I didn’t want to take the risk. Neither boy has been in the optimal position yet, so it was looking like we’d have to go cesarean anyways. Good luck to you and your boys. 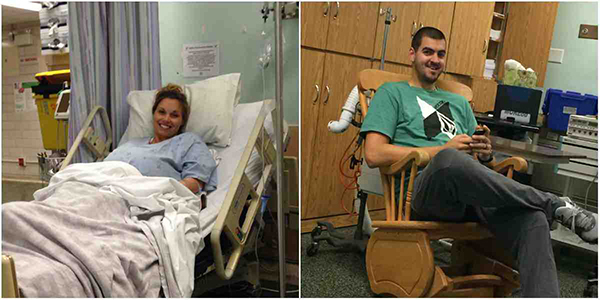 I’ll be praying for a safe and healthy delivery for the three of you! God bless! My twin boys are scheduled to come April 15th at 4:30 pm, and I am absolutely terrified! I pray to God that I have a great birthing experience like you did and that me and my baby boys come through safe and healthy. Thank you for posting this and being so detailed. Even though I’m still scared, as this is my first surgery ever, I feel a lot better about the c-section after reading your post. God bless! We just found out we are having twins around September. We didn’t know until a visit to the hospital for dehydration for my wife, and I saw them first on the ultrasound asking the tech “is that two”? I scared my wife to death as all I could do was cry and stare at the beautiful screen. When I finally was able to talk I told her and we shared several beautiful moments hugging, kissing, crying, and telling each other thank you and I love you. Thank you for your story, I want to help my wife as much as I can so I am trying to study and be prepared. I’m 10 weeks pregnant with twins and was told most likely c section. My first pregnancy. I’ve been pretty scared thinking about everything but,reading your story has really made me feel a bit better about everything! My fear has been when I get home from hospital with the twins I won’t be able to care for both at the same time. Your welcome! Just keep your focus on those precious babies and everything will be perfect. Congrats! Thanks for sharing! I had a med free vaginal delivery with my daughter, and will have a c section this time with the twins as A is footing breech! Like you, I have said all along “whatever is necessary for their safety is fine” but now actually scheduling the surgery for next week it’s a little more scary! Thanks for the concise summary! Absolutely love this story I am 22 weeks with twins & I am so torn between vaginal / c-section… I know I have not got full control over this but my consultant is all for vaginal if Twin A is in position but I worry then about Twin B I don’t like the sounds of manipulating it if he/she is not head down & I want as stress free as possible for babies which leads me to think a section would be easier on them. He has left the decision with me to make but I constantly worry about getting skin to skin with them and also their health – I think I’m driving myself insane When I asked my consultant straight out who has delivered all of his own children for his wife if it were your wife would you prefer her to have vaginal or section with twins he said if it were my wife I would probably tell her to have a section… so by that my decision has been made 90% but still niggling at me that I will be brought to recovery & loose that time with them although I’m sure once I have healthy babies that’s then main goal right! Thanks for sharing! Just found out that my twin delivery will for sure be a csection because baby A flipped over and is breech. I had such an awesome birth with our first daughter and I am so nervous about my csection that it’s taking away from my excitement!! Your story is encouraging! I am crying!! So glad that I found your blog. Found out this week that we are having twins and filled with so many emotions! Thanks for sharing your story. I’ll keep following and learning as I go through this amazing journey!! Thank you for your story. At 34+5 wks and our daughter (baby A) is breech so we’re pretty sure a C-Sec is on the horizon. Am fine with it, but I tend to get anxious and tense when I am not in control, so reading your story and hearing the details about the shivering, the strapping in, the pains and pressure are all really helpful for me to be aware of. Cant wait for these babies to come out and I cried buckets reading your story. Thank you. Thank you so much for posting your stories. I am 35 weeks with boy/girl twins and I’m so nervous and scared about having a c sec!!!!!! Such an amazing story! I cried reading the end of it and at some of your readers’ comments. I’m having twins and this is my first pregnancy. I feel so blessed and your story makes me even more excited to be a mom to twins! Thanks so much for sharing this; it has given me a lot of peace. Our second baby is due soon, and he is frank breech. My first baby was frank breech, too, but it was a surprise during pushing, so I delivered him vaginally. This time, we will have to choose between a c-section and attempting a repeat VBB. There are many reasons we may choose, or may need, the c-section, and I’ve been so stressed out about it. Seeing all of your joy in these photos helps me to feel so much better. It was great to read your story. I’m not sure if I’m more nervous for a c-section after reading or not, but at least I will be prepared! I’m 21 weeks and don’t know yet what my babies will choose for our fate. Hoping for the best but understand I’m not in control. Thanks for sharing your story in detail, it’s helpful to be prepared. I’m pretty sure I know of you, and if your dad was a Dr. I think he delivered me. We’re at CVH and if you’re still local maybe you’ll have some more tips/advice for me. I’ll keep reading some of your blog for more. Thanks again! 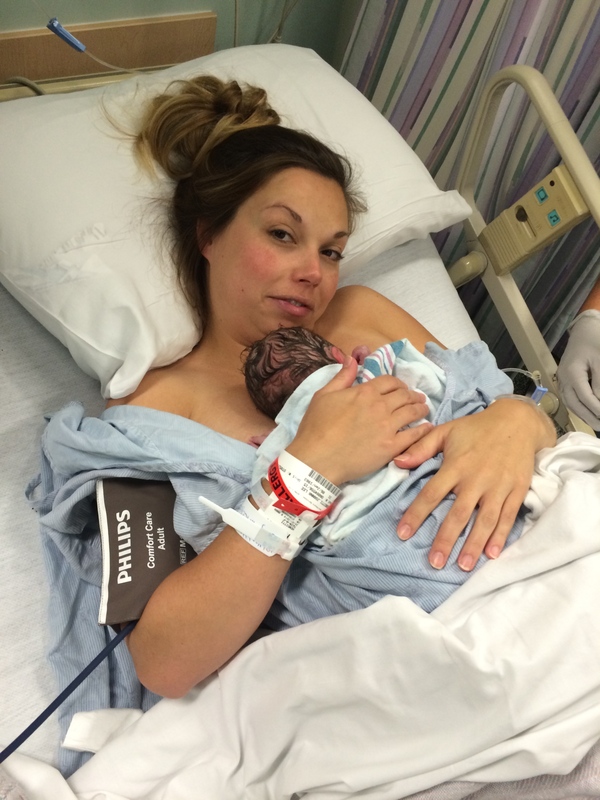 Thanks so much for detailing your c-section story! I am also carrying di/di twins and am currently 26 weeks. Although my OB has also told me that they’ll let me try to birth vaginally if Baby A is head down, I have a feeling that I’m going to end up needing a c-section. Reading your account has been immensely helpful in making me feel just a little bit more prepared. Thanks for sharing your story. I am currently 37 weeks with di-di girl twins with a scheduled C-section in six days. This gave me a little insight and I know that it has helped me get past my fears. Good to know others went through this and are doing well. WOW! Thank you so much for this! We just found out we are having twins, I’m only 6 weeks long but they saw both the heartbeats at an impromptu emergency room visit two days ago. 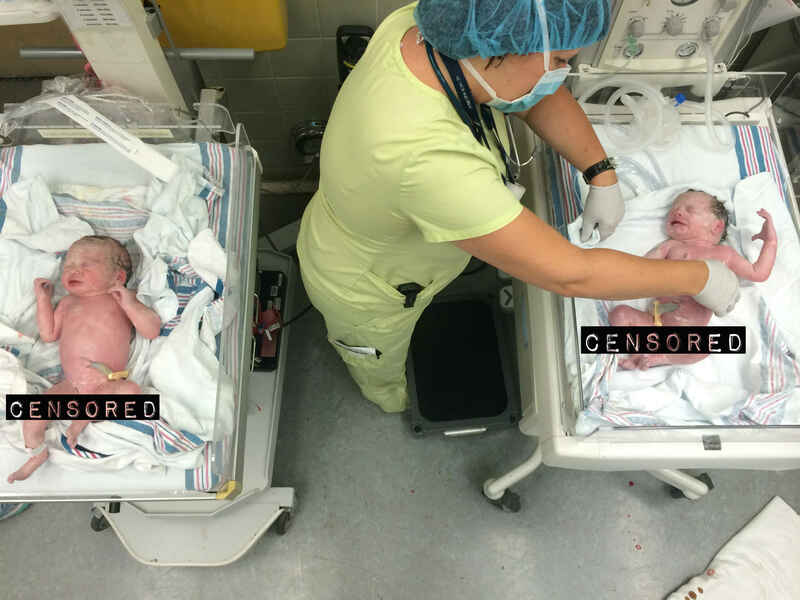 I had my first, a boy, back in August by C-Section, but I’m still very nervous about having twins the same way…your article definitely helped, and brought back some crazy memories! Particularly the shivering, I was shivering uncontrollably through my entire procedure. Just wanted to say thank you, reading your blog put my mind at ease! Thank you so much for sharing your story. 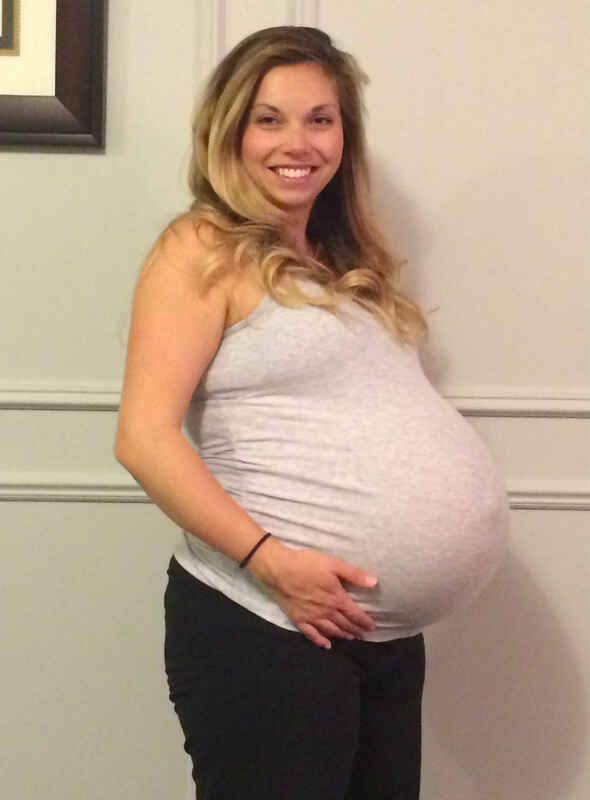 I am 28 weeks pregnant with twins, and I also had two previous natural births. I am nervous about my possible-section and complications for both me and babies. Your story helped put me at ease. Thank you! Your daughters are beautiful. This made me feel so much better. I’m 33 weeks with fraternal twins and a c section is what’s going to happen, my boys are breech. They are my first and I have no idea what to expect. Your blog felt different to me when I read it, like I was listening to you tell a story. I appreciate that. Im scared, nervous and happy, more scared then anything. But I really thank you for this. I needed it. Hope all is well with your family. Thank you for posting about your experience. I’m about 12 weeks pregnant with twins, my third pregnancy. I have two older boys. 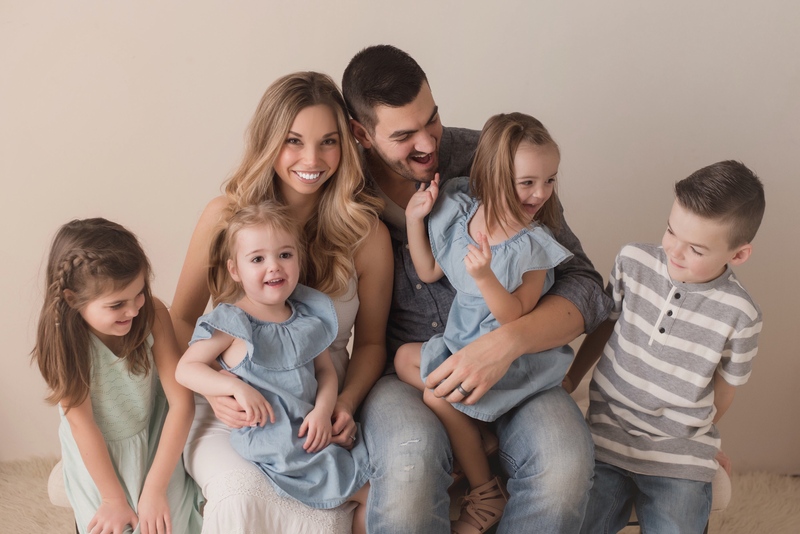 Since I found out I was pregnant with twins I have been trying to find out everything I can on what to expect and what we’ll need because this experience is different from my last two pregnancies. I’ve also been wondering if I’ll have to have a c-section or will I be able to deliver naturally. Your post has been helpful in giving me an idea of what it will be like to have a c-section. Thanks again for sharing your experience. Thank you very much for sharing your story. I am currently 14 weeks pregnant with twins and this gave me realistic comfort. Thank you so much for this. I am going through the exact same thing. Section at 37 weeks because hyper baby A flipped to breech at 32 and refuses to move back. Currently 35 and 4 and totally terrified. I really hope everything goes well, and this story really helped. Thank you so much for sharing. A person publishes your photo with heads of dog instead of your babies. She treated your photo! It is vile! I indicated to him that she does not have the right to do it, but she continues. Here is the link Facebook of the photo. Thank you so much for being honest & detailed in your post. I am 35+5 weeks pregnant with twin girls and they are pretty much in the same position as your girls were in. 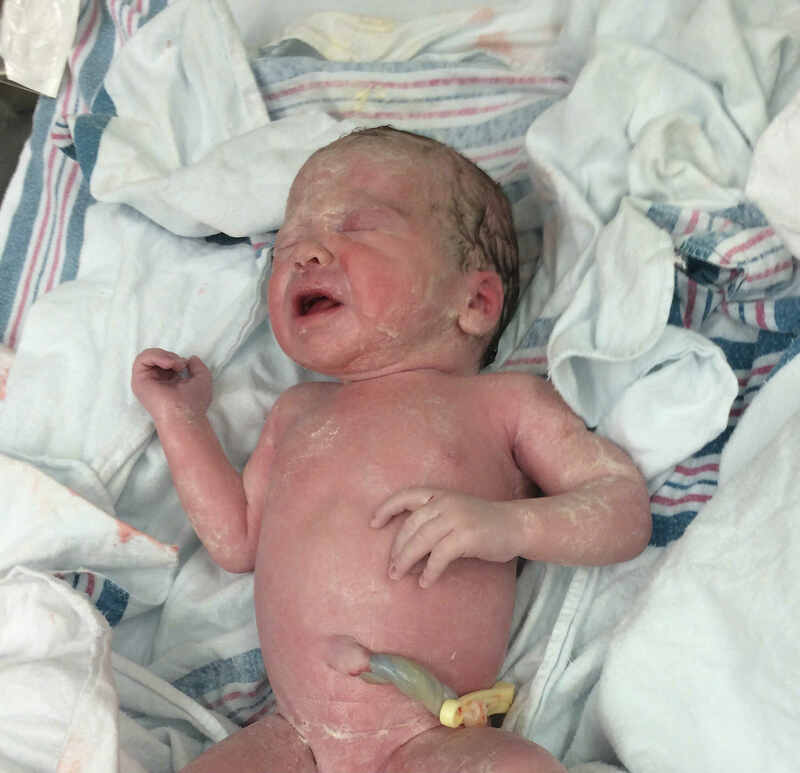 After having a vaginal delivery with my first child a caesarean seems so unknown and daunting. Your post has helped me feel less in the dark about what it might be like. Hope you are enjoying twin parenthood! Such a great story! Did you give us their weights or could you? I’m having my second C section in 3 weeks, but this time with twins and I’m sooo nervous. Any tips? hi, thank you so much for sharing your story. Am worried about having a vertical incision since both their heads are not on the same side. So my question is does it matter what sides their heads are for one to get a horizontal incision? for i would love to be able to have a normal virginal birth if i ever get pregnant again. Your story is literally almost identical to mine. Both are positioned exactly as yours were and are twin girls. Thank you so much for giving details regarding your delivery! I’ve been looking all over for testimonials regarding twin c-sections. I feel a little more at ease going into delivery next week at 37weeks. Thank you for sharing your story. It is awesome to read the play by play and start considering things I haven’t prepared for yet. Just got to week 17 with my twins. Thank you! I’m going to have identical girls that share a placenta, so this was very helpful! The chance of a c-section is definitely there at the moment, but there’s still time. I didn’t realize how big I might get!! Holy smokes I don’t know how I’m going to do my job the whole way through now haha. Thank you for sharing your story in detail! I am 32 weeks pregnant with twin girls and I was planning on vaginal delivery. I have two boys who I gave birth to vaginally and so the doctors anticipated the same would occur with my twins. I found out the other day that I was going to have a c-section which terrifies me. I have no idea what to expect and coming home with twins and dealing with a c-section at the same time is a lot to take in. So thank you for telling your story so I know more of what to expect. Thank you for posting this! The end made me cry. I’m excited to meet my little ones who are breach and transverse currently. I’ve also had two other kiddos naturally, so I’m hoping they will cooperate, but I just want them out safe in a few weeks. Thank you again!